Herbivoracious is a vegetarian cookbook authored by Michael Natkin. I've been following him on social media and his blog before this cookbook came out and even tested out the otsu noodles recipe. I did a little video to go along with each of my blog posts for this project, something I hadn't done in any of my previous cookbook projects. 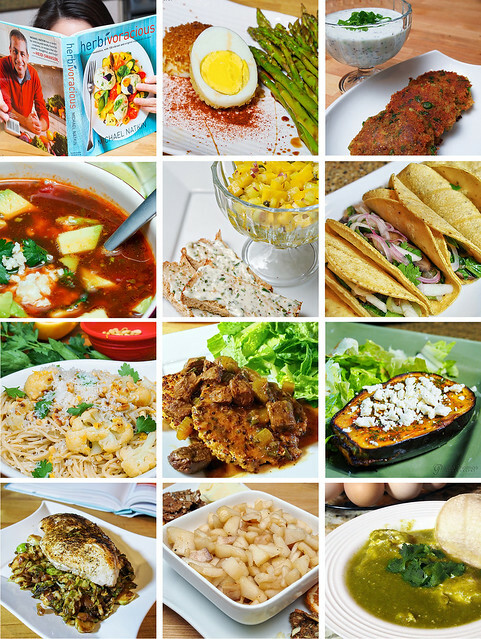 For my projects I take at least one recipe from each of the sections, photograph it and blog about it. Herbivoracious is filled with beautiful photography though not all recipes include photos. 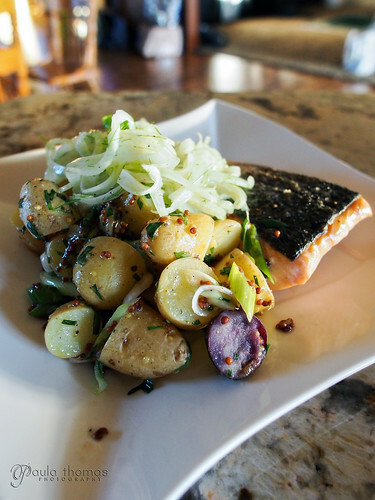 Michael was nice enough to put photos up on his blog for all the recipes in the cookbook that didn't include them so if you really want to know what the dish looks like before you make it, you can look it up on his Missing Images blog post. A lot of his recipes can also be found on his blog but there may be some variations to what was printed in the cookbook. I can't really think of much I didn't like about this cookook. It was well written and put together and there are some recipes I tried that I keep going back to. I've made the beet tartare recipe several times and is one that I will continue to make over and over again. Below are the recipes I tried. This is a recipe I made for my chickens for Christmas. I have been hanging it up for them every day while they are free ranging and bring it in at night to keep the rats away from it. It's a quick and easy recipe I found via Fresh Eggs Daily which is a great resource for any poultry keeper. At first I hung it up fairly high to make them work for their treat but decided to lower it later to make it a little easier for them and the little ones to get. Spray bundt pan with cooking spray and set aside. Stir gelatin into a measuring cup with the cold water and set aside for 1 minute. Pour boiling water into medium sized bowl and whisk in the gelatin. Add 8 cups of scratch, seeds, nuts, grains and/or dried fruit to a large bowl. I used 7 cups scratch, handful of mixed dried fruit (raisins, cherries, cranberries) and a little farro. Add melted oil and gelatin to the bowl of seed mixture and mix well. Place 3 cranberries in a row in each crease of the bundt pan. Carefully add the mixture to the bundt pan and press to compact. Place the bundt pan in the fridge overnight. Remove from fridge and turn pan over onto a cutting board and tap lightly. 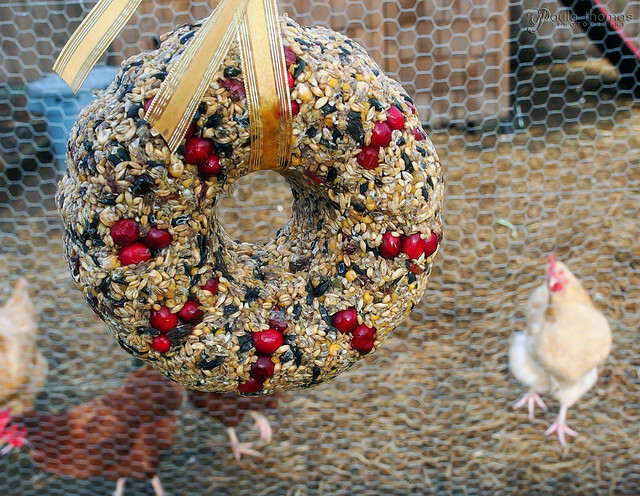 Tie ribbon around the bundt pan and hang for your chickens to enjoy. This is the last recipe for my Herbivoracious Cookbook project. It came from the breakfast section as one of the only gluten free recipes in this section. In Spanish, huevos means eggs and ahogados means drowned. I had to look up that last one. So I guess in English this would be eggs drowned in green salsa. 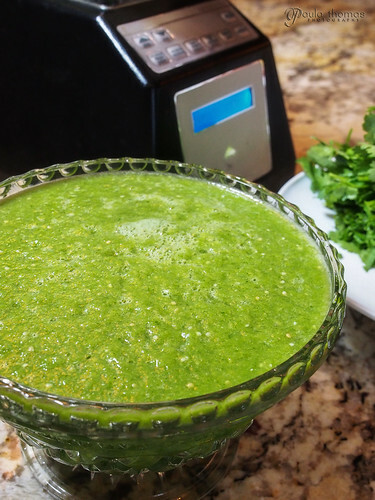 Instead of going the easy route and using store bought green salsa I decided to make my own. 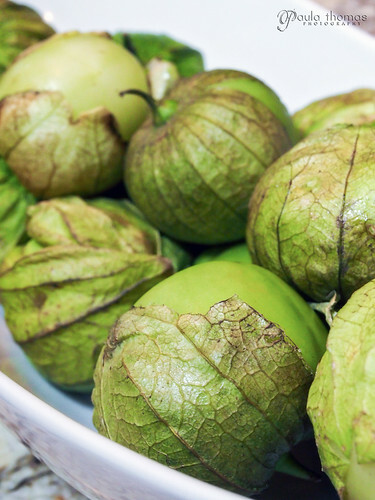 Luckily I was able to find some tomatillos at Fred Meyer though I doubt they are local. They aren't in season so I couldn't be too picky. My salsa ended up being a little more spicy than I would have liked. I used two jalapenos but they were really big ones so one probably would have been enough. I scraped out most of the seeds and ribs which helps lessen the spiciness. I ended up overcooking the eggs a bit so the yolks weren't runny. It's a little difficult to get the egg just right. My eggs ended up sinking down into the salsa so the eggs aren't as pretty looking in the finished photo as what was in the cookbook. Will have to try this one again with a little less heat and try to get the eggs cooked a little better. Instead of cooking the eggs in the salsa I might try making the poached eggs in my sous vide machine. My Brooks plum tree produced tons of plums last year and left me with more than I knew what to do with. I ended up making plum smoothies for breakfast, freezing some, giving some away, selling some to the nearby farm stand and made two batches of plum butter. 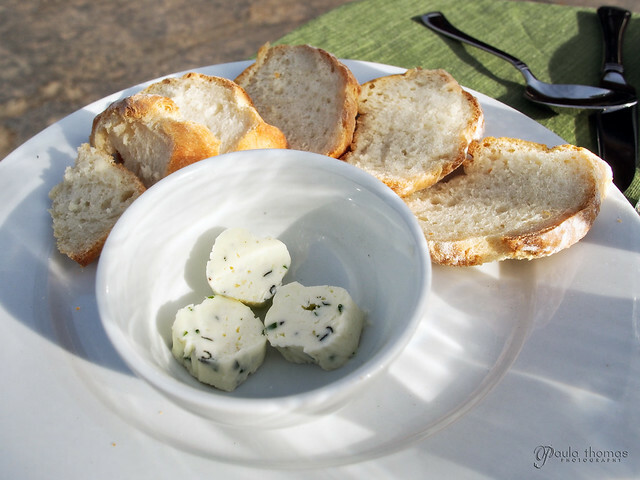 My cardamom plum butter recipe is also on my blog. 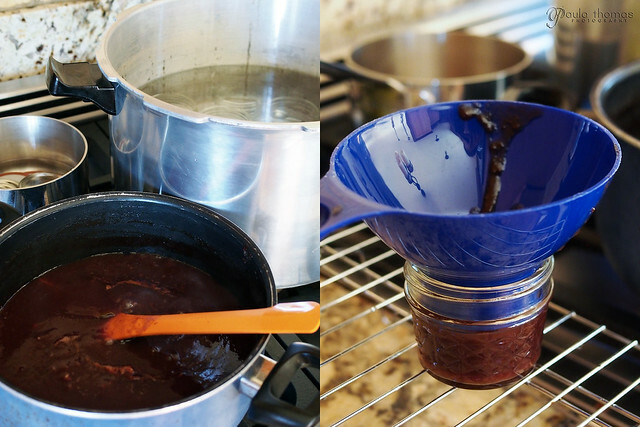 For this recipe I wanted to try using a slow cooker as I've seen many use this method for making butters but I have to admit, I do not prefer this method. Even after 8 hours in the slow cooker the butter seemed as thin as when I put it in. I was running out of day light and decided to scrap that method and finished it off on the stove top which took another couple hours to finally thicken to my desired consistency. So I don't think I'll be using that method again in the future. Fruit butter can be used for a lot of things whether it's spread on toast, slathered on pancakes, spread on your sandwich, baked in cookies or as I've done most recently, spread on Lesley Stowe Raincoast Crisp crackers with cheese. I got this package of cranberry hazelnut crisps from IFBC this year and they are some of my favorite crackers. They are indeed crispy and are perfect topped with fruit and cheese. They even make a few "wheat free" crackers made with oat flour. I created a video this time showing each step of the process including the canning of the plum butter. Add all ingredients to a bowl, stir and refrigerate for a couple hours or overnight to allow flavors to meld. Taste the mixture and add more honey, spices and/or plums if you'd like. Pour the pixture into a large sauce pan and bring to a gentle boil and then reduce to a simmer. Or heat on low in a slow cooker for hours and hours and hours. If it doesn't thicken as quickly as you'd like, transfer to a sauce pan to thicken. Continue cooking for another hour or longer or until desired consistency. You can put a bit on a plate and refrigerate a few minutes to check consistency as it does thicken more when cool. Store in the refrigerator for a couple of weeks or process in a hot water bath for 10 minutes for longer storage. My batch ended up making about 8 pint sized jarss of butter. You may get more or less depending on how thick you make it. I just discovered Gregarious Cellars during a trip to Pine Creek Nursery in Monroe, where they do tastings on the weekends. 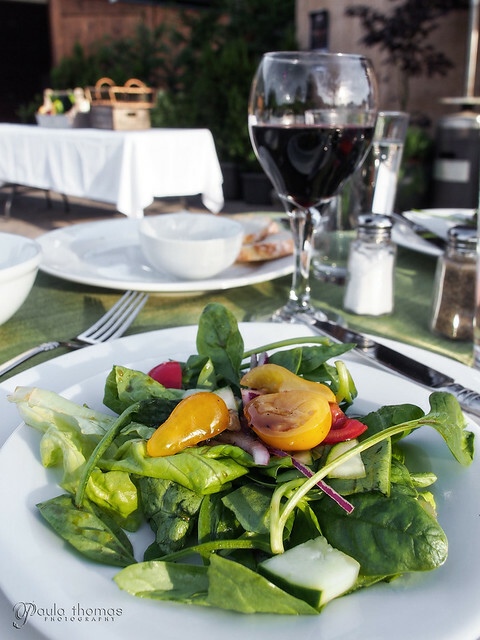 Pine Creek Nursery also does "Taste from the Garden" dinners during the summer and Gregarious Cellars is always there to pair their wines with the four course meal. 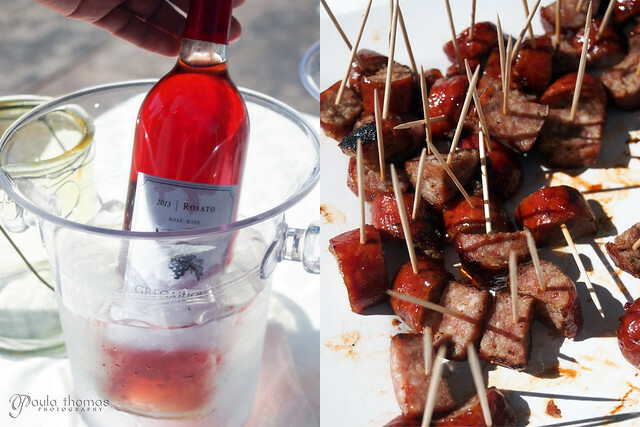 We attended three of the dinners this year and got to try different wines each time. 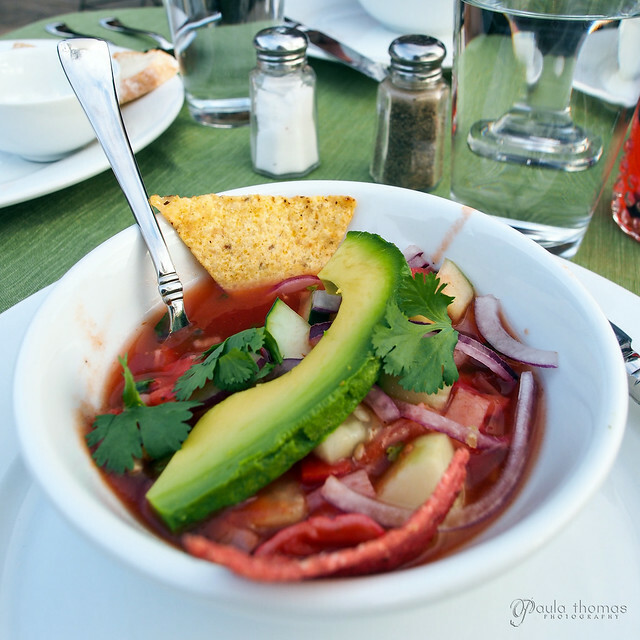 The dinners are only $40 per person and come with a complimentary glass of wine. Any additional glasses are extra. 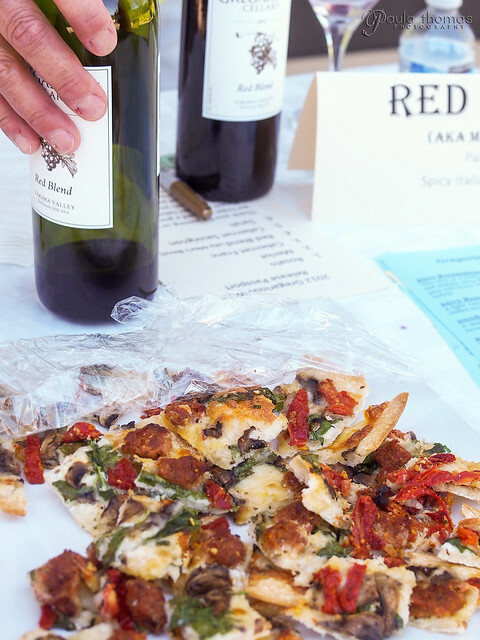 Gregarious Cellars hasn't been around for very long but word of mouth is getting out there and their business has been steadily growing over the past couple of years. They've doubled their wine production in the last year. The wines are very impressive for such a young winery and it's no surprise that they have grown so much every year. Two of their wines deserve special mention because they are wines I typically don't care for and actually ended up buying bottles of them. 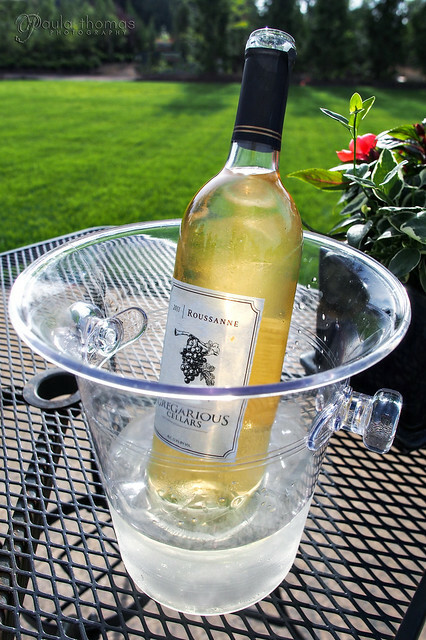 2011 Roussanne: A white wine that we actually preferred served at room temperature. Mark and I are not normally white wine drinkers though we drink it on occasion and we were talked into trying it at the first "Taste from the Garden" dinners we went to. It seemed very different from any white wine we've had before. It didn't seem to have as much acid. We liked it so much that we bought a bottle to bring home with us for $15. Before I move on to the 2nd one I also had to mention that the 2011 Syrah is fabulous. It is very peppery, just the way I like it. Unfortunately they are sold out of it and their 2012 doesn't have the same amount of pepper but they promise that with age that peppery taste I like will be there. 2011 Merlot: If you know me, you know Merlot is probably my least favorite red. I don't like the dry chalky coating most of them leave in your mouth. 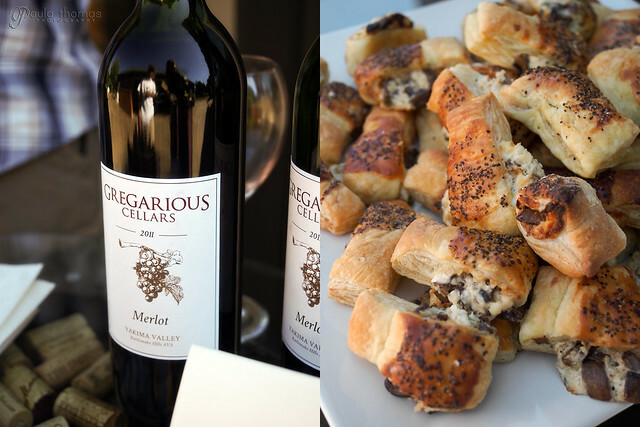 I tried Gregarious' 2011 Merlot during the release party paired with mushroom cream cheese puffs and wouldn't you know it, it was my favorite wine of the whole release party. They have very limited quantities so if you want a bottle you better hurry on down to Pine Creek and get one because as of last Friday they only had a case and a half left and I went home with a bottle for $25. I think I will store it for a year or so and see if it gets better with age. 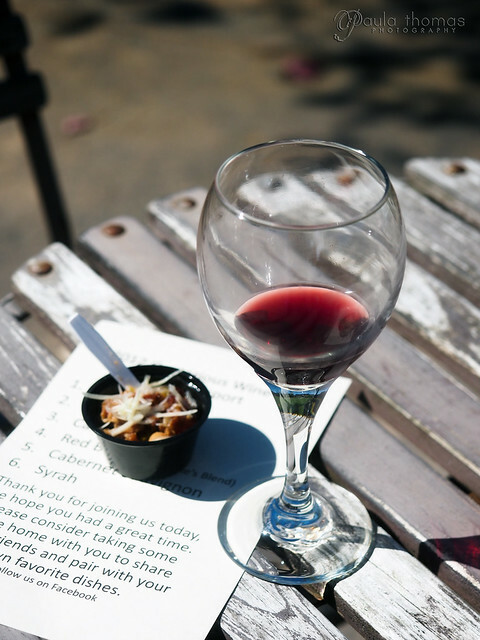 They had a 2012 release party at Pine Creek Nursery where they served 6 different wine and food pairings all for free! My favorite bite was probably the dark chocolate brownie and as mentioned before. the 2011 Merlot was my favorite wine. 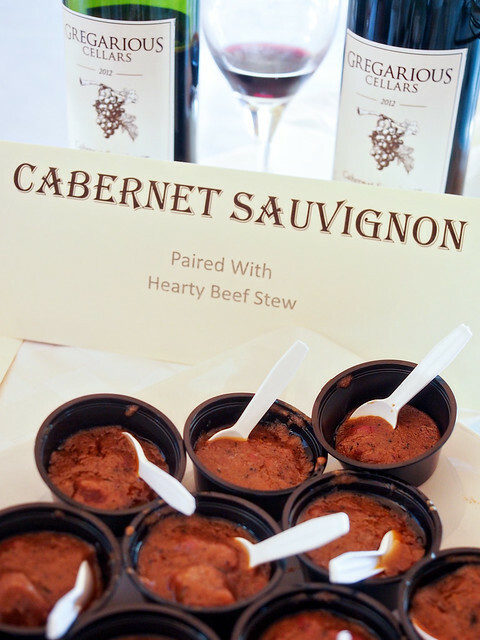 The best food and wine pairing however probably went to the 2012 Cab Franc with Tuscan Bean Soup. We had the Cab Franc again at the last "Taste from the Garden". It was recommended as a good pairing for the entree which was pork tenderloin, butternut squash and potatoes and it was a good pairing indeed. It might be my next bottle of wine purchase. There was a 2012 Red Blend that was paired with a sausage pizza that was pretty good too. The blend was actually created by a guy named Mike at one of their blending parties. They had a little contest to see who could come up with the best blend and he ended up winning. They may be doing another blending party next year so I'm going to have to keep my eye out for that, it sounds like a lot of fun. 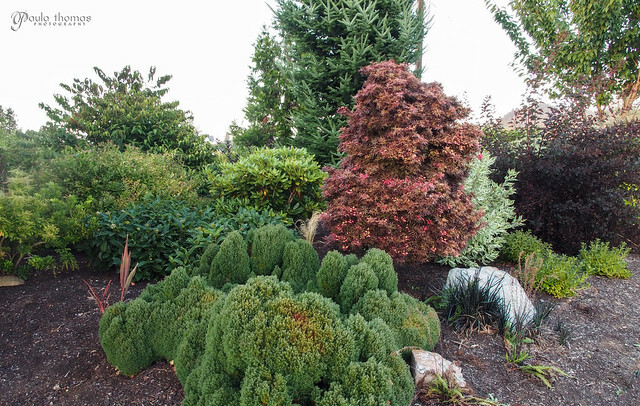 Be sure to follow Gregarious Cellars and Pine Creek Nursery on Facebook to find out about upcoming events. I've got a bunch of carrots in my garden that are over due for picking and thought a soup would be a good way to use them up. 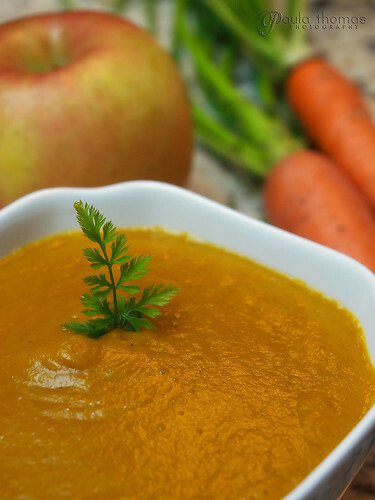 I coincidentally got an email from Blendtec today with a carrot soup recipe and was my inspiration for this recipe. 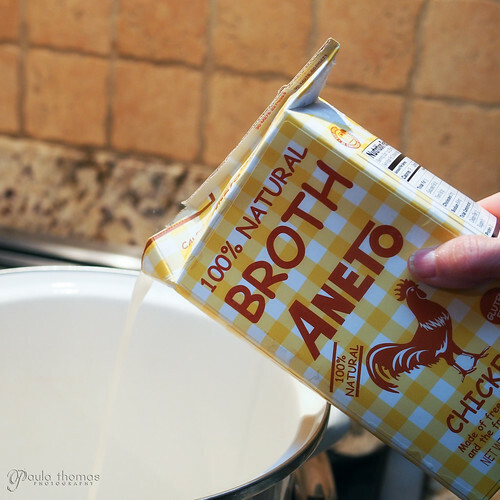 I normally make my own broths and stocks but I received a box of Aneto chicken broth from the swag suite at the International Food Blogger Conference (IFBC) so thought it would be perfect for this recipe. 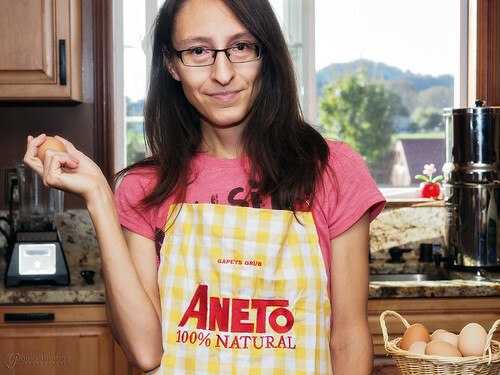 Aneto is all natural and doesn't contain any MSG or unrecognizable, hard to pronounce ingredients like many others do. Ingredient list only contains water, chicken, onion, carrot, leek, cabbage, celery and marine salt. This is stuff I would use to make my own broth and tastes just as good. Another thing I got from Aneto on the first night of IFBC is a nice personalized apron with my blog name on it. Another item I picked up at IFBC was one of my favorite olive oils, California Olive Ranch. It's my go to olive oil and almost always have a bottle of it on hand. California Olive Ranch was at IFBC in 2013 too and did an olive oil tasting that opened my eyes to what makes a good and a bad olive oil and how to taste the difference. Olive oils don't age very well so it's important to get the freshest bottles you can and store them in a dark cool place. You always know what you're getting with California Olive Ranch because they put the olive harvest date right on the bottle so you know how fresh it is. I wish all olive oils had dates like that. It's just something to look out for when you're olive oil shopping. Most olive oils are imported from Italy so it's nice to know there is a good olive oil made right here in the US with olives grown in California. 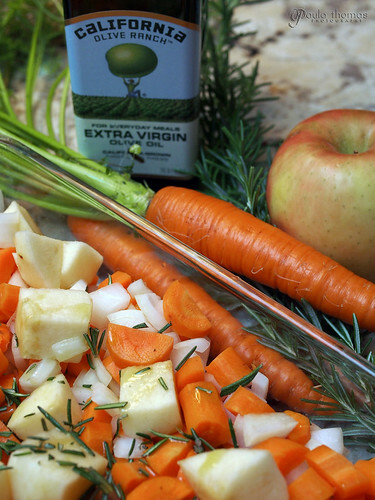 Add chopped carrots, apple, onion and rosemary to a 9x13 baking dish and drizzle with olive oil. Bake until carrots are tender, approximately 45 minutes. Heat broth in a saucepan and add cooked vegetables, thyme, salt, pepper and celery seed. Simmer for 5 minutes. Pour half or less of mixture into a blender jar and blend until smooth. Empty into another container and blend the remaining mixture in one or more batches. Add additional salt and pepper to taste if needed. 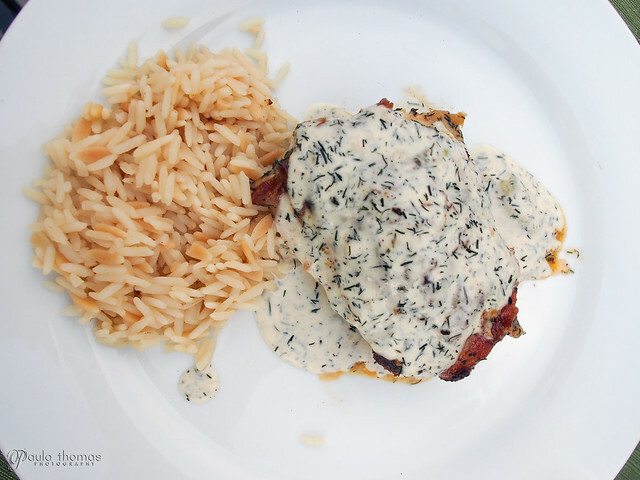 Sereve, topped with a fresh herb garnish of your choice. It's my first fall in the new house and my first experience with a plum tree. If you don't know about plum trees, the fruit seems to all ripen at one time or at least within a week or two and it's that time with my tree. I give the ones that fall off and not usable to my chickens. They love them. The rest I've been using in as many ways as I can. I even sold 10 lbs of them to a farm stand and they said they were sold as soon as they put them out. I also like putting them in my morning shake or just eating them fresh off the tree. 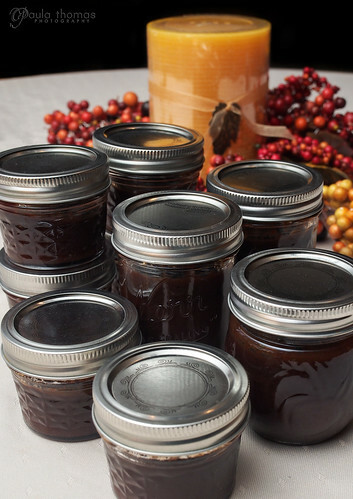 I decided to try making a fruit butter and used two different recipes and liked this honey cardamom version the best. I did some searching for a sugar free plum butter recipes and found one on hitchhikingtoheaven.com that looked good. I made a few changes to the measurements and added more plums because I thought it was a little too sweet. It might also depend on the type of plum you have so be sure to taste it before cooking and adjust anything you feel needs adjusting. I didn't have cardamom pods so substituted cardamom powder instead. I also used vanilla extract instead of vanilla bean. 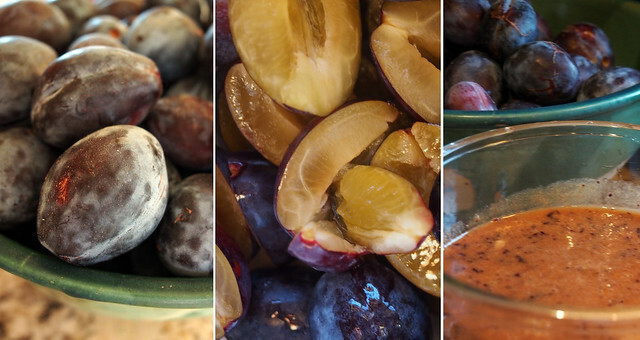 Cut plums in half and remove seed. 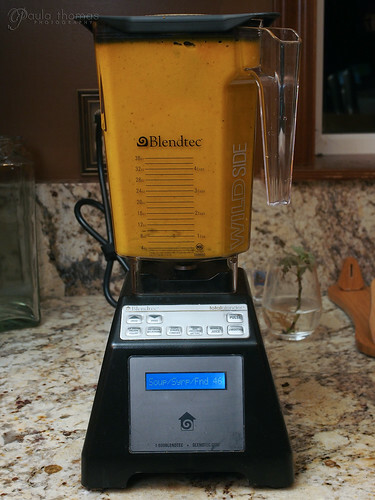 Add to a blender and puree. You may need to do in two batches. 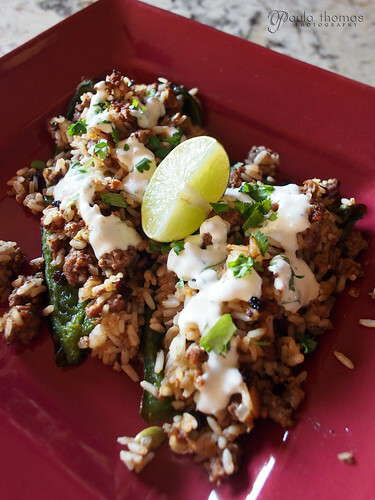 Add all ingredients except bay leaf to a bowl and refrigerate over night to allow flavors to meld. Pour the pixture into a large sauce pan, add bay leaf and cinnamon stick to the mixture and bring to a gentle boil and then reduce to a simmer. My batch ended up making about 60 oz of plum butter. 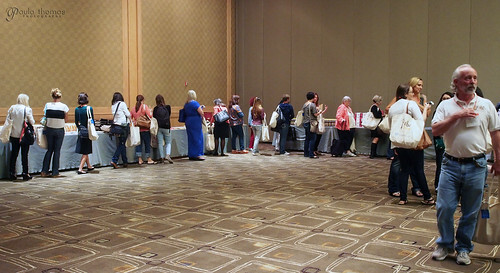 I signed up for IFBC 2014 right after the 2013 conference was over, excited that it was again going to be in Seattle. It was two days before the opening reception and I was getting excited, especially since at the last minute I got off the waiting list for the very limited space excursion at Sur La Table. It was shaping up to be a fun and exciting weekend of meeting lots of new bloggers, getting to sample tons of delicious food and learning new things from a wide variety of speakers. I couldn't wait! In one day my excitement turned to feeling like I was going to die and had to cancel my spot for the excursion and cancel my dinner reservation with Jean Layton from glutenfreedoctor.com. :( I came down with some kind of stomach issue Wednesday night that had me bedridden and unable to eat for several days and am finally starting to feel better, a week later. The jury is still out on what my problem was. I visited the walk in clinic twice and got 2 bags of fluids during my second visit which made me feel a little better. They took blood tests and UA tests all of which didn't really tell them much of anything. I'm still waiting for the stool test results to come back in hopes it may show something but since I'm starting to feel better it may not really matter. At least I can eat now. It wasn't a total loss though I did manage to pick myself up and drive an hour to the opening reception which was maybe not such a good idea given my condition. I wasn't having any sinus issues so don't think I had anything contagious but I had very little energy at that point and unable to eat. I had planned on getting cheaper parking at the Warwick but didn't think I could walk the couple blocks there and back and since I hadn't planned on staying for more than an hour I just parked at the Westin where the conference was being held. I dragged myself from the car to the reception hall where there was a line of people waiting to get in for the food, but food was the last thing I was thinking about other than wishing I could have it. Unfortunately though, I had to walk by it to get to the gift suite which is what I was really there for. Call me selfish but I paid for the conference and couldn't eat anything and didn't have the energy to do much socializing and I wanted to get something for what I paid for. The gift suite was in a MUCH bigger room than previous years and seemingly more organized unless I was too late and missed all the frantic pushing and shoving. Tables were lined up all around the outside of the room and a smaller circle of tables in the middle of the room with more goodies. It appeared some things had already run out before I got there though I didn't think I was that late. I missed out on getting to try some of Sahale Snacks new flavors and was the sponsor I was most looking forward to getting goodies from. I heard people were grabbing their stuff by the handfuls but others said there was a rep handing them out one per person. Maybe that changed when they saw people were taking too many. Anyway, it's a great company with a great product and I had such a good time with them last year touring the Sahale Snack factory. I didn't leave without meeting at least a couple of new people though. The two people in front of me in the gift suite line were both from the same area as I am in the Snohomish Valley and I got their cards. I had new moo cards all ready to go for the conference too and forgot them at home so had to hand out some older non-food ones I had with me. Oh well, at least I had something to give out. 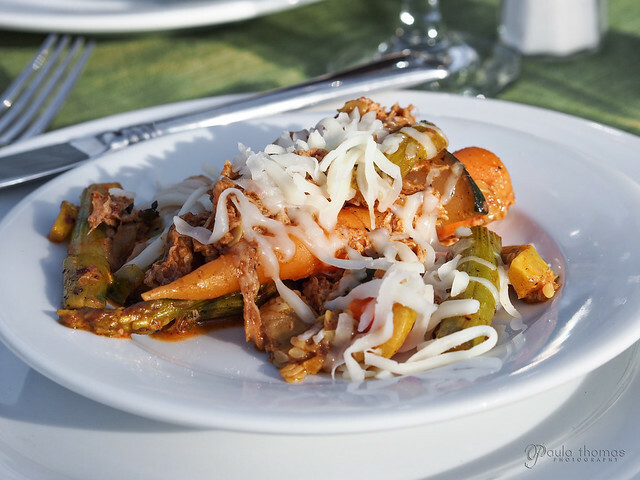 Kristi Kaiser from Inspiration Kitchen is also a food photographer and has some great looking recipes with beautiful photography to go with them on her site. 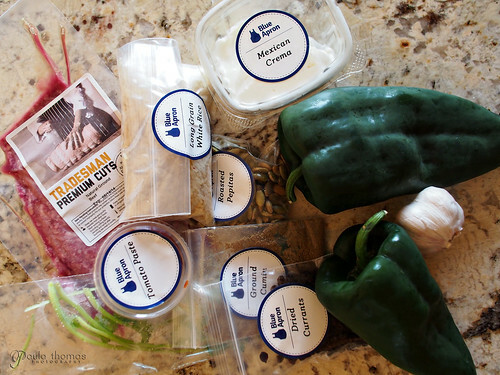 I also met Kristi Rimkus from Mother Rimmy's Cooking Light Done Right who also has a blog filled with good looking healthy recipes and some great pictures too. It was nice to get to meet them briefly and hope to stay in contact with them. I was able to attend the conference virtually through social media but it just wasn't the same and watching all the awesome looking food I was missing out on and that amazing Sur La Table gift bag people got was a little rough but I'm glad everyone had fun and hope someone lucky person was able to take my place at Sur La Table. Hopefully next year I'll actually get to go for more than an hour. 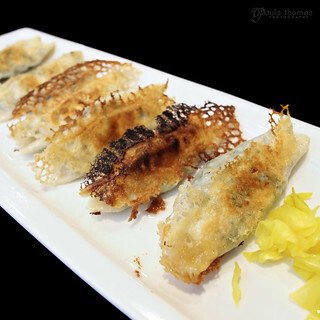 Dough Zone is Bellevue's newest Asian dumpling house, located in Crossroads. The lines are long for dinner but lunch isn't as bad. It's great having a bunch of fellow foodie friends on Facebook so I hear about all the best new restaurants. Mark Mizuno and his wife have been going there a couple times a week and expressing how great it is on their Facebook newsfeeds so I had to check it out for myself. Unfortunately not gluten free but I made an exception to check it out with a couple of my co-workers. One of them also made an exception to their vegetarian diet for the jian buns but I won't mention any names. I think we both agreed it was worth it. Dough Zone is probably best known for their jian buns (jian bao). 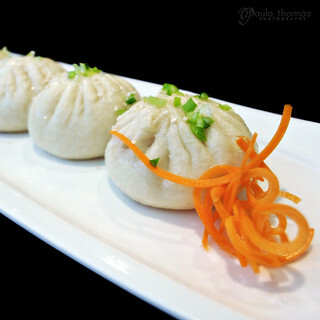 They are buns filled with a mixture of pork and steamed and pan fried so the tops are pillowy and soft while the bottom has a nice crispy texture from the pan frying. So tasty and the prices are quite reasonable too. We ordered 5 dishes for the 3 of us off the paper menu in which you check off the items you'd like. Total price, $28. Not many places you can feed 3 people for that price. There's been a lot of comparisons between Dough Zone and Din Tai Fung which has been Bellevue's most popular dumpling house and still seems to bring in more customers. I also recently discovered Din Tai Fung is a chain located in 10 different countries. Dough Zone is still young and no chain restaurant. Most that have tried it prefer it and their lower prices. So it may not be long before Dough Zone becomes the more popular choice. They are on opposite ends of Bellevue so Din Tai Fung will still be popular due to it's location downtown which has a higher population. 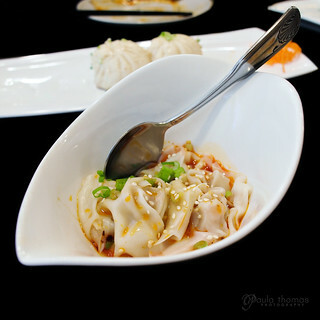 I haven't technically been to Din Tai Fung so can't say for sure which I prefer but I did get to taste some of Din Tai Fung's dumplings at a Foodportunity event in 2012 and was not disappointed. Have you tried them both? Would love to hear your thoughts on which you prefer. Dough Zone serves family style and not everything comes at once so it's nice to have everything spaced out so the hot dishes don't get cold. Our first dish was the sweet and sour cucumber which was a great way to start the meal. 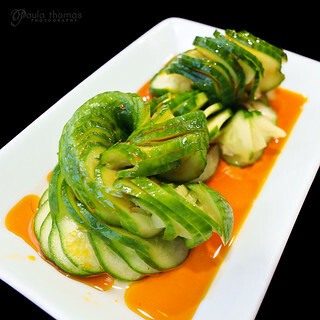 The way the cucumber was sliced was exquisite and allowed the flavors to get inbetween all the layers. It looked kind of like a slinky. I thought it was designed using a machine at first but looking at it more closely I think it was made by hand. Next up were the pan fried leek dumplings which were surprisingly flavorful. 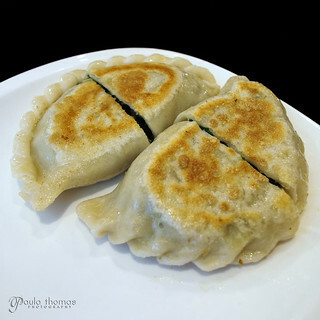 The two large dumplings were cut in half and what made it even better was a touch of their homemade hot sauce dropped into the middle of the dumpling. The shape of the dumpling was also very well formed and looked machine made. I was expecting the wontons in szechuan sauce to be a little more spicy but I rectified that by utilizing the homemade hot sauce to spicen it up more. Then there was the famous jian buns which I already mentioned and lastly, the vegetable potstickers. They were the least favorite of the 5 dishes we tried. They weren't that flavorful and the pan frying was not very consistent. If you like Asian dumplings this is definitely a restaurant worth trying. I'd definitely go back and try some of the other dishes like the juicy pork dumplings and I'd get the jian buns, cucumber and leek dumplings again. At this time they don't appear to be on social media and their website is not in English but there is a phone number and hopefully the person that answers speaks English. I received a free trial of Blue Apron Meals from a friend and was holding onto it for a few weeks before I decided on which delivery week to get. 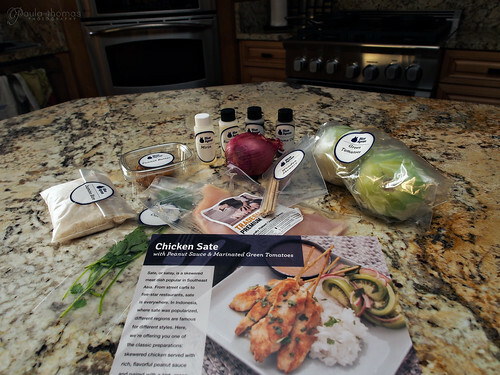 If you're not familiar with Blue Apron, they are a meal delivery company that will ship you a box of ingredients to make 3 different meals for $9.99 per serving per meal. 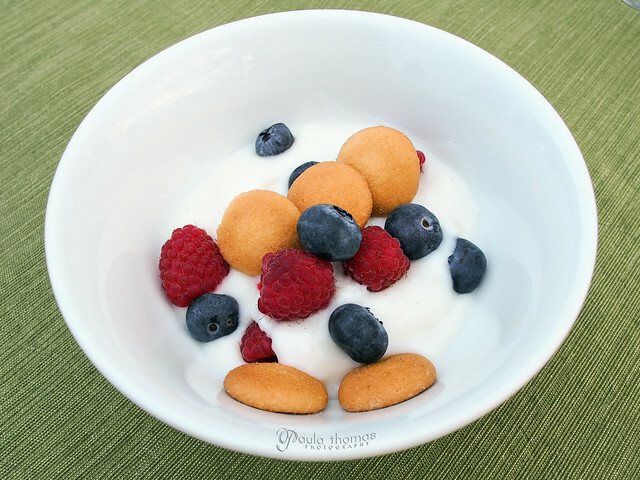 I think it's a great idea for those who don't like to meal plan and go grocery shopping which I think is many of us. I usually don't decide what I'm making for dinner until the same day or sometimes even minutes before I start cooking, as I am looking through the fridge and cupboard to see what I can make with what I've got. I would definitely use the service more if they used organic produce and had gluten free options. Until then, I will keep my eye on the schedule and if anything I can't resist comes up I'll be sure to request it. Being able to choose which weeks I want and don't want to receive easily from the site. Getting email notifications with what is scheduled for the coming week and review the recipes beforehand. The quality of the fresh produce was very good. Nothing was wilted or spoiled. Photography and styling for the recipes is very well done and on glossy card stuck that is easy to clean if spilled on. 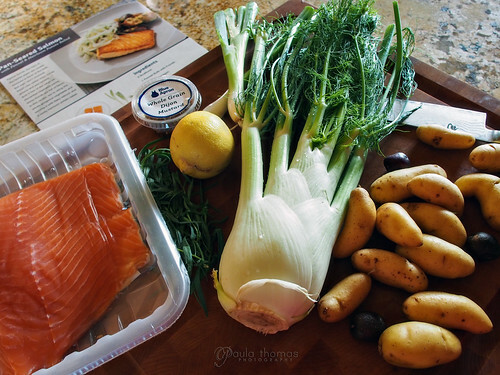 Everything you need to make the dish is included in the box in the measurements needed. Most of the fruits and vegetables however require washing and chopping yourself. The recipes are available online whether you sign up for their service or not. Click the titles below to see the recipes for the three I received. Would love to see gluten free meal options. Organic produce would be nice. I try to avoid inorganic and GMO produce as much as possible. Below is a recap of the 3 meals that I received. Not all of them were gluten free but I chose a week with minimal gluten. 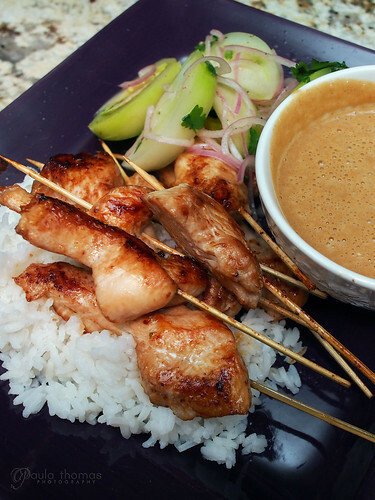 The chicken satay was probably my favorite of the three meals. I don't recall ever having green tomatoes before and it was fun trying something new and definitely something I would eat again. They had a nice crunch you won't get from a red tomato. The sauce had a lot of ingredients I don't normally keep in my pantry so this is where Blue Apron comes in handy. I wouldn't want to go out and buy a bunch of these ingredients and only use them once. Since they only provide the amount you need for the recipe it's no problem. For this recipe the chicken was not pre-cut and the instructions didn't seem clear that you needed to cut them yourself as it wasn't in the instructions. I would have realized that if I had read through all of the instructions before making it which is something you should always do. Marinating the chicken before cooking it kept it from getting dry after frying and it got a nice char on it. It's something I'd make again if I had all the ingredients on hand. This was a dish that didn't have any surprising or unique ingredients except maybe the tarragon and fennel which are usually easy to find. So I could have made this dish fairly easily without help from Blue Apron but the recipe was good and everything came out well. I was surprised by the quality of the salmon. I'm not sure what kind of salmon it was but the skin crisped up very well and I didn't overcook it which is very easy to do with salmon. That's why I like using my Sansaire to sous vide it and always get the perfect temperature every time. This was the last recipe I made and the least favorite of the three. Maybe because I am half Mexican, I expect more from Mexican food. If you like Mexican, I recommend Authentic Mexican by Rick Bayless. He isn't Mexican but he's been around and it's good stuff. Anyway, the peppers didn't really hold their shape after roasting so it was difficult to get the stuffing to stay and it wasn't really that good looking of a dish compared to the other two. However, the Mexican Lime-Crema was a nice addition that helped save it. It could have also used a side dish like some beans or maybe a light salad to go with it.. 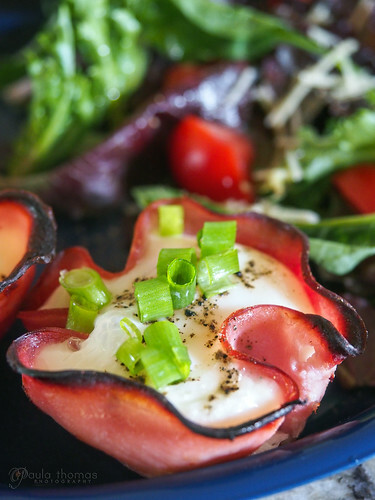 I'm always looking for new and interesting ways to make a healthy breakfast, especially when eggs are involved. I've got 6 chickens at my new house and they give me eggs every day, more than I can possibly eat. This recipe gave me a chance to do something different with them. I've had a recipe for these pinned on Pinterest for some time but finally got around to making them while my parents were visiting a few weeks ago and have made them a couple times since then. They are fun, quick and easy to make. I like to serve it with a salad but would go well with hashbrowns or fried potatoes too. Place a slice of deli ham in each cup of the muffin tin. Crack an egg into the center of the ham. Add salt and pepper to each egg. Put in oven and bake for 12 mins or until desired doneness. Add garnishes of choice and serve. It's been a busy few months! I unexpectedly sold my house to my neighbor's sister and managed, within a couple of months, to find a newer bigger and better home that's 15 minutes closer to work. It was a little more than I originally planned to spend but still affordable. I had an awesome realtor to help me with the journey. If you're looking for a realtor in the Redmond area, Mark Mizuno from John L. Scott is your guy! He's got mad negotiating skills. I was debating whether to get a house with a smaller yard with closer neighbors or a house in the boonies with acreage or somewhere in between. Either way I wanted to be a little closer to work. I decided on a large 3 bedroom that looks like it's in the boonies but is actually only a couple min drive from Monroe. 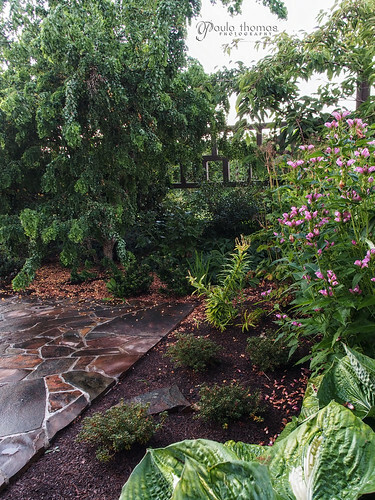 I'm on .5 acres in the Sky Valley and the majority of it is heavily landscaped. There's probably at least 100 trees, flowers and bushes on the property to take care of in addition to 6 chickens and a decent sized garden and greenhouse. The grass looks small in comparison but it appears to take longer to mow than the old house so I may be investing in a riding mower in the near future. It will be more work than the old house but much more rewarding. 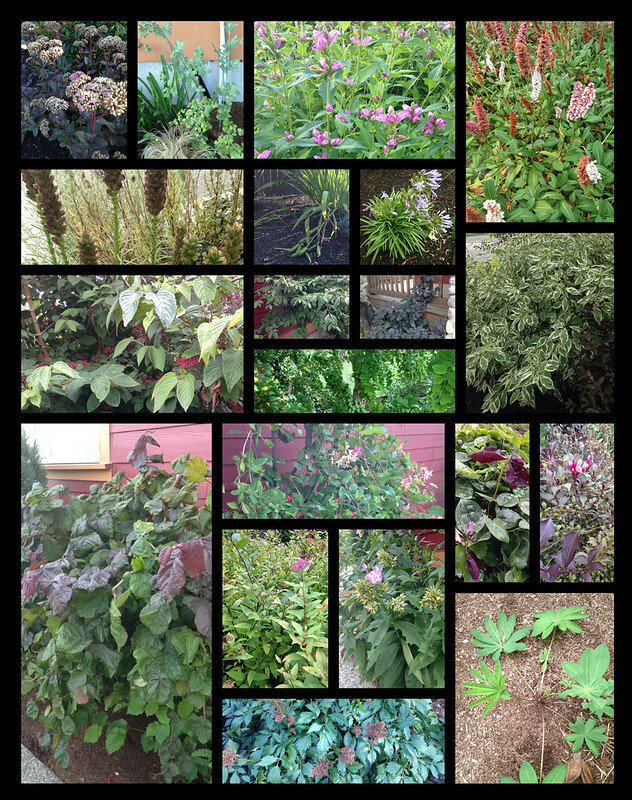 I couldn't identify half of the things growing around my new yard so I decided to try an iphone app called Garden Compass. I've read about many apps that you can take a picture and it will immediately tell you what it thinks it is and most of them don't work as well as advertised, very inaccurate. This app however works differently. You take a picture and it emails it to a team of plant identifiers and someone actually looks at the photo and tries to identify it. If they aren't positive what it is they will let you know and may ask you to send in another photo when the plant is flowering to be sure. I only had that happen with one of the plants I submitted and the answers I got all seemed to be pretty spot on from what I can tell. The app is great but it also has room for improvement and more features. Lots of ads in app when viewing past answers. Need paid version with no ads. Could use a searchable database of own submissions as well as others and include fields for amount of sun and water needed for each plant. 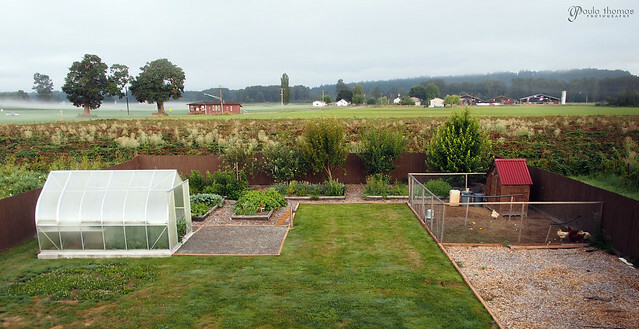 The back yard with garden, fruit trees and chickens. 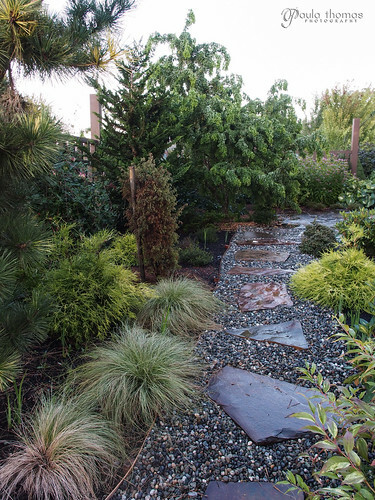 It was Michelle Newell that introduced me to Pine Creek Nursery via a Facebook post. I practically drive by it every day but never really noticed it before. I decided to visit one day after work a few months ago and picked up a few flowers for a container. While there, I signed up for their mailing list and I got my first newsletter a few weeks ago. They have lots of events from concerts to dinners. Mark took me to their "Tastes from the Garden" four course meal (technically it was five courses) for a late birthday present. The dinner was outside, straight through the store on a lovely stamped concrete patio. 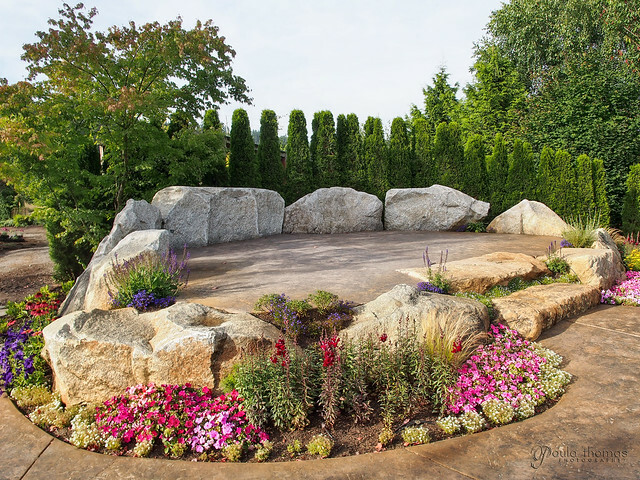 They have a hardscaped stage surrounded by flowers and trees where they must have the bands play. 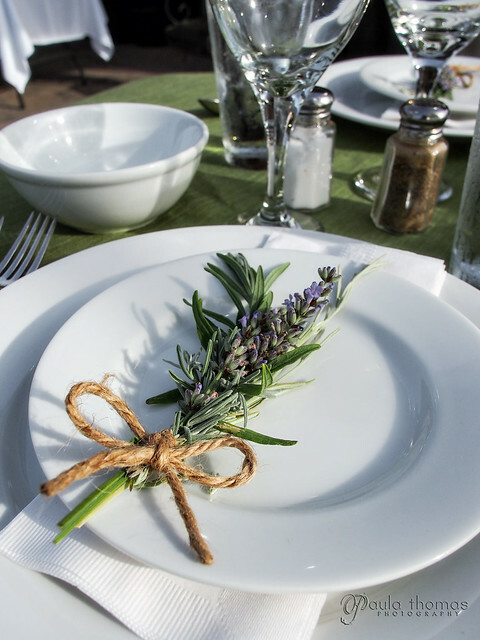 There were several tables set up with place settings topped with a bouquet of rosemary and lavender. We didn't notice until we left that there were name tags on the tables so we didn't actually sit where we were supposed to but apparently the table we sat at was not reserved because it didn't have one on it. Each table was served a plate of homemade artisan bread with a bowl of compound butter which didn't count as one of the courses. It wasn't gluten free bread so I didn't eat much of it but I did have a little taste just to try it and it was good. Soon after the bread was served, someone from Gregarious Cellars came by with a bottle of white wine. It's not a winery I've ever heard of and probably very few people have. As far as I know the only place you can get it is at the nursery. They have a tasting room there that's open Sat/Sun 12-5. Mark and I are not fans of white wines but it was the first wine that was brought around. You get one glass with dinner and we wanted to save it for a red so we didn't get a full glass of the white but we did get a taste and we were pleasantly surprised. It was probably the best white wine we've had. It was a 2011 Roussanne wine which is a French grape that I'd never heard of. It was so good that Mark bought a bottle on the way out. Even though we really enjoyed the tasting of white we both decided to try the Syrah which is my favorite red wine and it didn't disappoint; it had a strong pepper finish which is just the way I like it. We also got a glass of the red blend which was also good but we both liked the Syrah better. 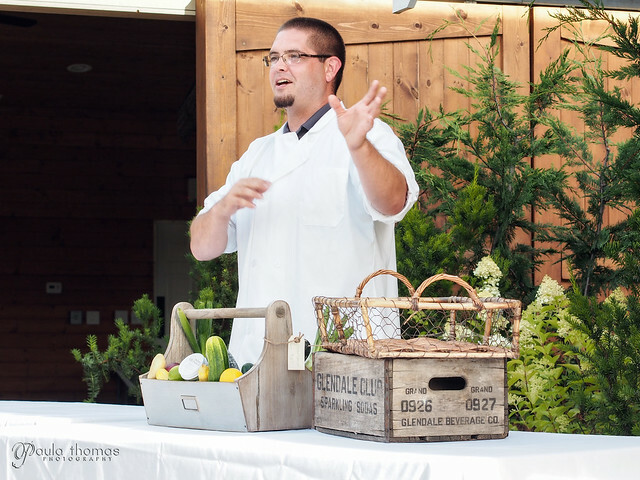 Chef Aaron Brown presented each dish and answered questions about each one. After everyone was served he would also go around to each table answering more questions and asking how everything was. I enjoyed everything and most of the dishes were presented well with the exception of the main course. It wasn't very consistently plated and if it were me I would have presented the chicken on top of the bed of rice. Mark's was plated with the chicken and rice on opposite ends of the plate with about 2 inches separating them. Most of the dishes were made from scratch (except for the yogurt) and most of the ingredients were local (except for the chicken) with most of the vegetables coming from Willie Greens Organic Farm in Monroe.